Went this weekend to Area 51. Saturday we got to the main gate just in time to see the cammo trucks giving a break. They now drive dark green Chevys. One came around the bend and drove up the hill as I was standing on the border. It parked on top and the one up there came down and drove past me, turned right and went back around the bend. It seems they're less worried about being noticed/identified than they used to be. As we pulled out of the border, another truck came off mailbox raod and turned right, blowing by us heading for the border. The next day we went to South Tikaboo road and the Solar shed is gone, we'll see what (if anything) replaces it. The "West side road" (off of Valley Road) to the border gate that is in the valley between hills, has been plowed to become a great road. Last July it started out as a two wheel rut, but has been reworked to the border. The road to a flat hill the Cammo Dudes use has been plowed under. Most likely, you can now only access this hill through the restriced area. They watched us last year on it (it is on public land) as we toured a hill near the Rachel side of the range. Last year we u-turned and went around a bend, seeing a cammo truck coming up from Vally Road. They literally drove into the desert and around us to avoid being indentified. 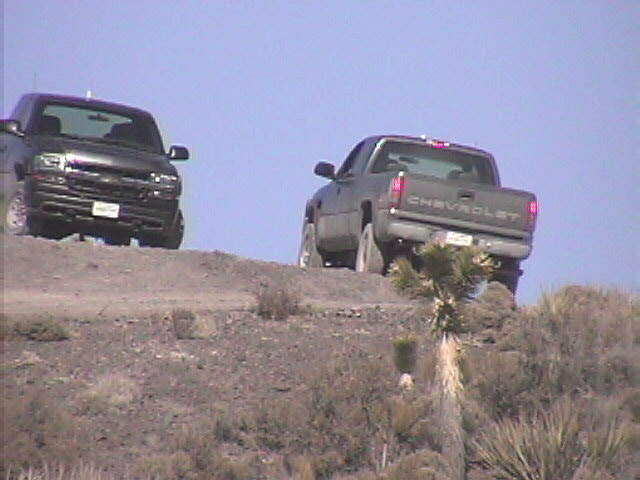 Then they went up that (now non-existant) road to spy on us from public land.